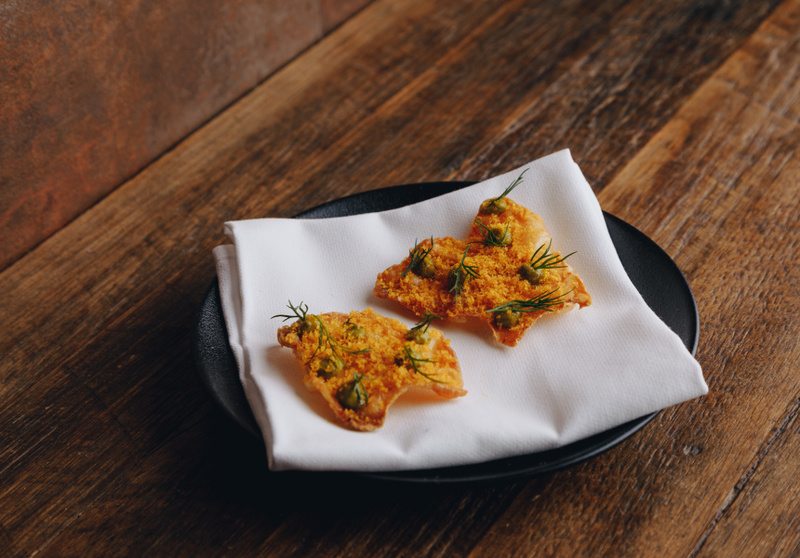 Broadsheet Kitchen chef Ryan Dolan introduces a crispy appetiser that pairs well with a Spanish lager. In partnership with Estrella Damm, we show you how to recreate Cabale at home. 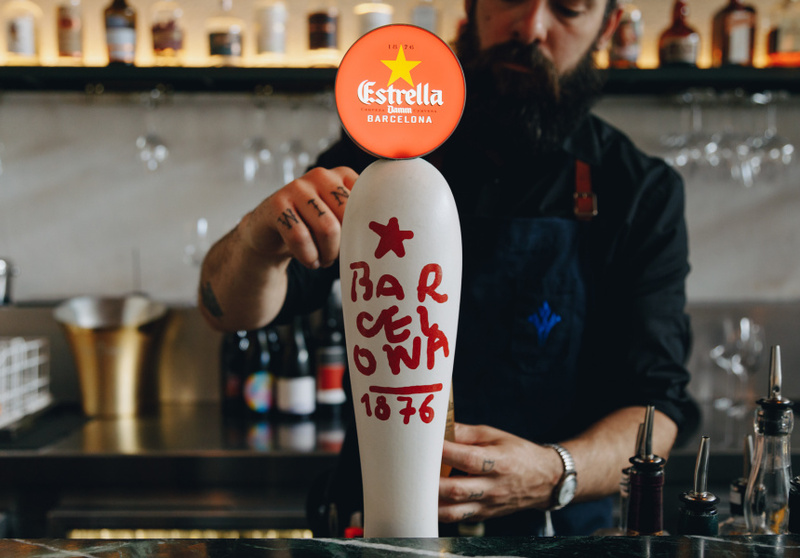 There’s only one beer on tap at Broadsheet Kitchen: Estrella Damm. With that in mind, the Collingwood restaurant’s chef, Ryan Dolan, has shared a simple but surprising dish from his menu that pairs well with the easy-drinking lager – and can be easily prepared and enjoyed at home. 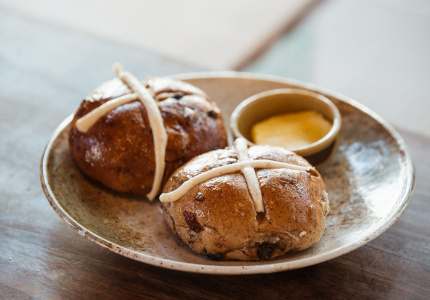 Dolan was appointed Broadsheet Kitchen’s first resident chef in October 2018, following a national search for Australia’s brightest food talent. 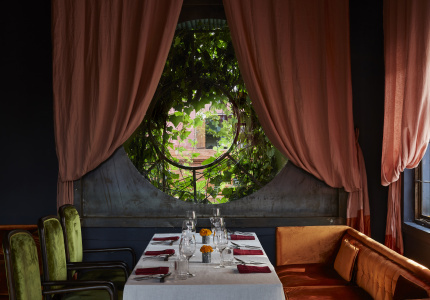 The Queenslander spent six years cooking in Lyon, France, where he learnt the French dining concept of bistronomy – the inspiration for his small-menu concept restaurant Cabale, which will be in residence at Broadsheet Kitchen until January 26. To pair with Estrella Damm, which translates to “star” in Spanish and Catalan, Dolan has selected a popular Spanish appetiser. Chicharrón (plural: chicharrones) is puffed, fried skin – usually pork belly or pork rinds, but sometimes also chicken, mutton or beef. It’s a common summer snack in Spain and South America. 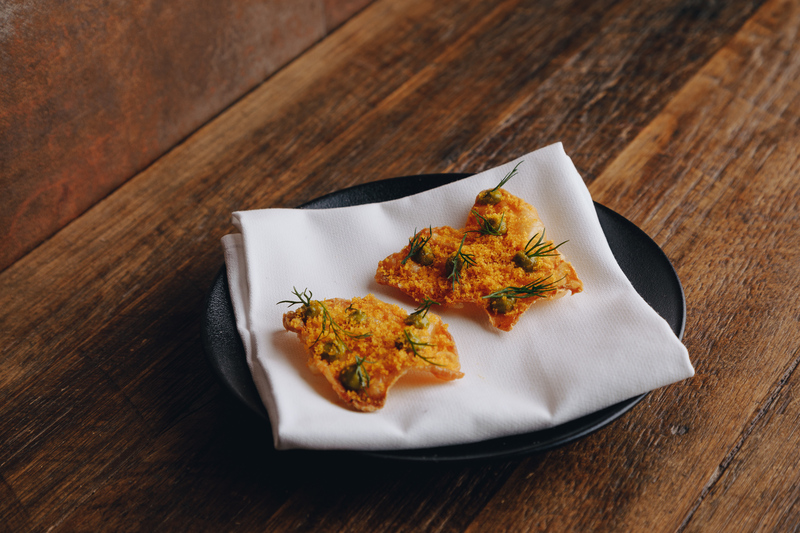 Dolan’s take on this crunchy classic combines chicken-thigh skins with a bright and vibrant salsa verde and grated bottarga, or mullet roe. Of course, skin from other parts of the chicken can be used too, but Dolan only uses thighs for this particular dish – putting the remainder of the skin and meat to use elsewhere on the menu. Estrella Damm, has been brewed in Barcelona since 1976 with the warm Mediterranean climate in mind. It effortlessly makes the leap from Spanish summers to Australian ones, and it’s best served cooled (between four to six degrees Celsius) in a glass lightly tapered at the top. 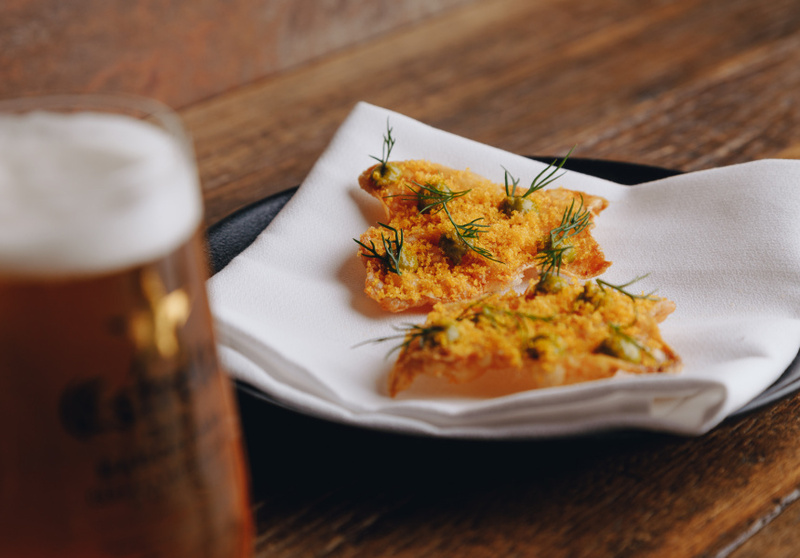 Chicken skins are a great snack to serve with Estrella Damm. The lager’s barley malt, rice and hops are a natural match for the dish’s flavours, and its long, bitter finish cleanses the skins’ oily intensity. Things are busy in the Broadsheet Kitchen, but Dolan takes his time with this dish. He stresses the importance of letting the skins cool right down, so they contract and harden into a crispy, crunchy mouthful – the perfect beer snack. He serves it with salsa verde, and grated bottarga, the Italian name for a delicacy of salted, cured roe from the grey mullet that often features in Mediterranean cuisine. Dolan sources his from South Australia, and says it gives the chicken skins a fresh, salty pop. 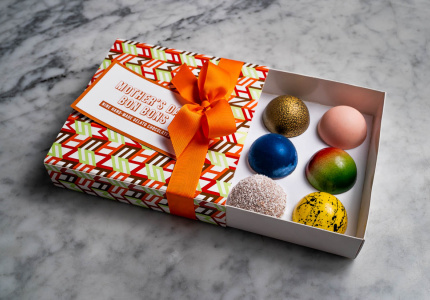 “The bottarga works well with the aromatic and citrusy notes of the salsa verde, which is made from tarragon – a good match for the chicken; dill – for the roe; and parsley, to tie the two together,” he says. The dish has proved very popular at the Smith Street restaurant, which can seat 50 people at a time. When he can, Dolan enjoys watching people’s faces when the order goes out. Lay the skins out on a chopping board and remove any excess meat or fat by scraping the skins with a knife. Next, lay the skins onto a baking tray lined with greaseproof paper and sprinkle them lightly with salt. Then bake for 25–35 minutes, until the skins are golden brown in colour. Remove the tray from the oven and put it aside until the skins have cooled to room temperature. Bring a medium saucepan of water to the boil and prepare a bowl with iced water. Blanch the dill, tarragon, parsley and garlic cloves in the boiling water for 1 minute. Remove them from the water, refresh them in the iced water, then remove them and use your hands to squeeze out any excess water. 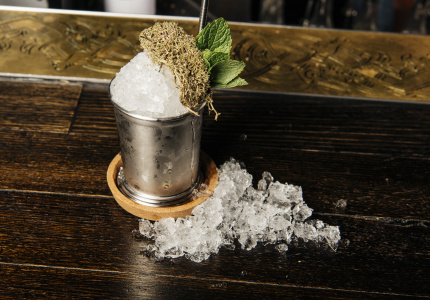 Finely chop the herbs, then grind together with the rest of the ingredients in a mortar and pestle. Chef’s note: in bigger quantities (say, two or three times) the salsa verde would be made in a blender or Thermomix. You might consider doubling or tripling the recipe to make a bigger quantity, and using the salsa verde as a pasta sauce or meat marinade. Turn the cooled chicken skins over to their undersides and place them on the serving plate, then spoon over the salsa verde. Grate the bottarga over the top, then garnish with some dill sprigs. Ryan Dolan’s Cabale will be in residence at Broadsheet Kitchen until January 26. This article is produced by Broadsheet in partnership with Estrella Damm. in partnership with Estrella Damm. Learn more about partner content on Broadsheet.